Austria currently boasts the most strictly controlled and closely regulated wine-producing country in the world. Here, production is concentrated in the east of the region away from the Alps in the west, with most of the vineyards located to the north. Most widely celebrated for its dry white wines, predominately made from Grüner Veltiner, Austria has certainly created a point of difference for itself in the export market. With limited plantings of Riesling mostly in Niederösterreich, they are slightly more tropical in style than its Alsatian and Germanic counterparts and age beautifully. 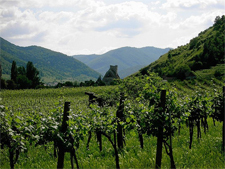 Producing a variety of styles, Austrian wines range from dry still and bottle-fermented sparkling wines, to sweet botrytised wines and Icewines. We have the finest wines from notable producers such as Loimer and F.X. Pichler, which are not to be missed.